During our visit to Seattle, we were surprised to stumble upon the Harry Potter Exhibition at the Pacific Science Centre. I paid the $52 ticket fee for the two of us (with much grumbling from Jong over the prices nearing extortion) and we moseyed 'briskly (can't be letting those 8 year olds pass us!) up the stairs and through a passage to the exhibit line up. 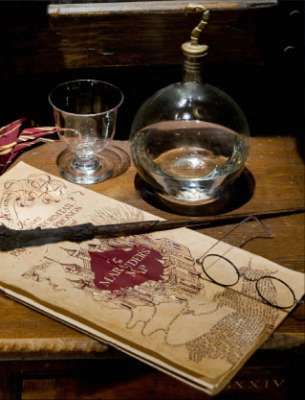 The exhibit begins in small groups in a intimate, dark room where we meet the sorting hat and children can be sorted into their favourite Hogwart's schools. All the children wanted to belong to Gryffindor (of course). After that, we were brought into another circular black room which had all the different movie posters backlit.. Once everyone was inside, the posters came to life and became a multimedia teaser of the Harry Potter Exhibit with each of the panels working together and sometimes as windows.It was about 5-10 minutes to refresh your memory of how Harry mets Ron, his adventures.. a highlights reel from all the movies… It was interesting and creative, The 5 split panels presenting it in a new manner. Behind us a wall opens up.. and your eyes are hit hard by the lights of an approaching train. 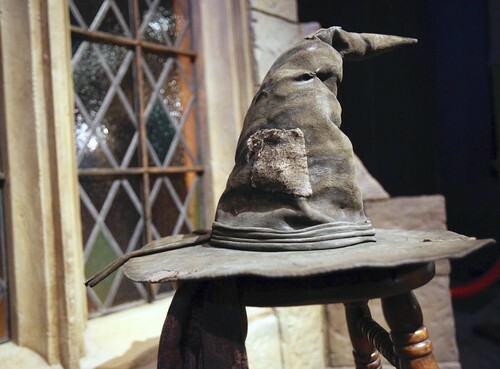 An usher in a hooded cloak and lantern guides the tour toward the rest of the exhibit - another richly lavish hallway full of animated photographs … moving photos just like the halls of Hogwards including the woman in the doorway protecting the entrance to the Griffindor house. I could understand how a Muggle raised Harry might be overwhelmed by the changes in his reality. It was disconcerting to see the moving pictures even knowing they were just small screens. 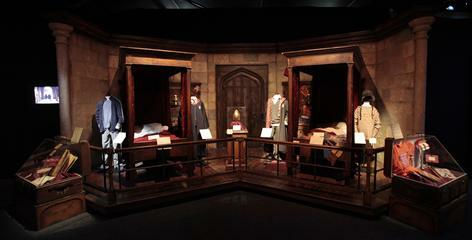 Each exhibit had a screen that showed scenes from the movie in which the props were seen. Their tiny first year outfits. Uniforms for the quidditch teams, from the nationals, to the school teams, Cedric Diggory's uniform, and Oliver Wood. Victor Krum, Cedric, Cho, and Hermoines outfits for the ball. Dolores Umbridge's terrible pink and kitty room. Books and newspapers created for the movie. Hagrid's house including his pets. The Half Blood Prince's old text book. a recreation of the great hall including the food. Nothing was in glass boxes. All behind velvet ropes but there were people in each chamber to make sure no one was touching anything. Also, ABSOLUTELY no photographs but I was sooo tempted a few times. There are many photographs on the exhibit's official website. At the end of the exhibit is a store to buy Harry Potter Merchandise from house scarves or ties, to Xmas decorations. It was just so mind boggling, We did the entire exhibit in around 1 hour but could have easily have spent 3 hours. My mind was humming for hours after… What an amazing experience. Highly recommend it. A lovely surprise.